If the movie “Hot Rod” taught me anything, it was three things. 1. Journey’s “Don’t Stop Believing,” is a timeless, feel-good rock anthem. 2. “W(H)iskey” is not an applicable safe word when speech impediments are rife and 3. “You gotta risk it to get the biscuit.” (Literal meaning of that last one… You have to go out on a limb for what you really want). It’s far easier said than done, I’m afraid because for starters, you have to know what you want (this is something that changes over time) and then you have to know how to go about getting it. So bearing in mind that biscuits can be people, a job or any other choice that you are faced with over the course of your life, I have taken a look at my own biscuits and those in the jars of the people closest to me in order to come to the following conclusion… There really is no in-between when it comes to risking it for the B (biscuit). What do I mean? Well, there are in fact two kinds of people when it comes to the quest for the B… There are those that risk far too much and on the flip side, those who don’t risk anything at all. I guess what I want to say to you is this: Dear people, it pays to be a combination of both of these. Whether you’re a Risker or a Sitter, choose your biscuits carefully. Riskers, I can tell you from personal experience that there’s no use going full Ricky Bobby ”If you ain’t first, you’re last” for a Lemon Cream, or even worse… one of those dodgy pink wafers from the Bakers’ Biscuit Assortment. You know the ones I’m talking about, the ones that taste like they’ve been left out all night, when in fact they’ve only just been opened. (But hey, if that’s your thing, I won’t judge). Ask yourself, “is this the biscuit I’ve been waiting for?” If it’s not, let it pass, someone will be happy with that Lemon Cream or even old pinky, but not you… You’re destined for a Romany Cream! To the sweet, gentle Sitters out there, for goodness sake, figure out what kind of biscuit you want. You’re not Avril Lavigne and things really aren’t that complicated. Once you’ve decided, get up, go out and make it yours, son! Sometimes, if you’re lucky, the right biscuit finds you (that’s called serendipity, like that movie starring my beloved Kate Beckinsale and John Cusack) but that may or may not happen, so until it does, nothing bad will happen to you should you decide to go after one. Let’s face it, we’ve all had our share of hair-raisingly terrible biscuits. Sometimes life lays them out for us with a glow that’s a lot like Instagram’s “Verdana” filter. They look so tempting and utterly delicious that we’re tricked into thinking that they’re meant for us but in actuality, they really aren’t. So we eagerly take a biscuit thinking it’s the very one we’ve been looking for all along… Flash forward and we’re left feeling shortchanged, disappointed and with a bad taste in our mouths. What do I mean? Well, it could be as simple as the shade of hair dye that you chose at whim on a bad day, the biscuit you kissed at Tiger Tiger or even worse, the biscuit you dated when you were young who turned out to be as dependable as Eskom’s load shedding schedule. It may be what you chose to study, the fact that you never chose to study or what you’ve chosen to do with what you studied. It could be your current job, your current life and even your current mindset. The great news is, there’s always time for a new B. You still have chances and more importantly, you still have choices. So what if gingersnaps (or actual gingers) weren’t for you, there’s another flavour out there that could be far better. Don’t take it personally, in fact, not everything that doesn’t work out is a loss. The truth is, we will never know what worse biscuits our bad biscuits have saved us from. Be grateful, you could have been stuck with a raisin bran. Ha. So shake things up, be brave enough to pick another biscuit, or even better, wait for a fresh one. 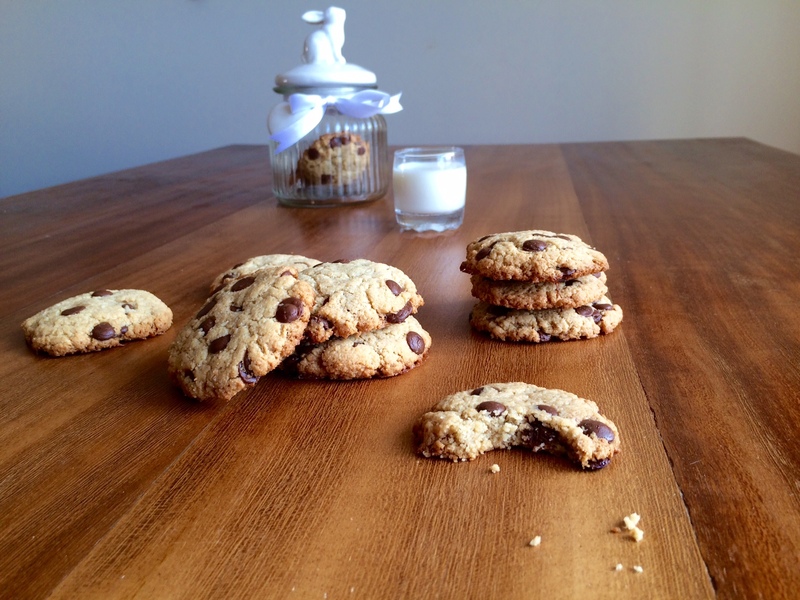 This recipe is for my Chipper Choc Chip Cookies. 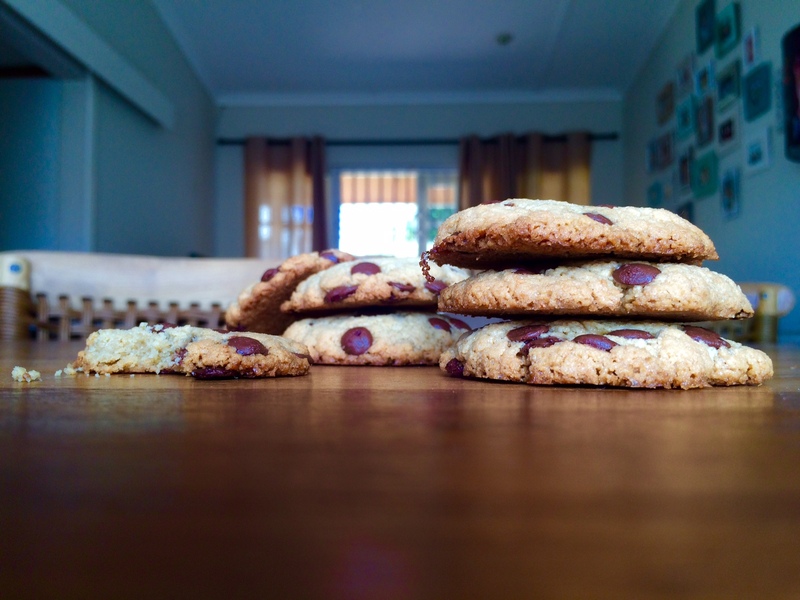 They’re wheat, gluten, sugar and dairy free (depending on the choc chips you use of course). 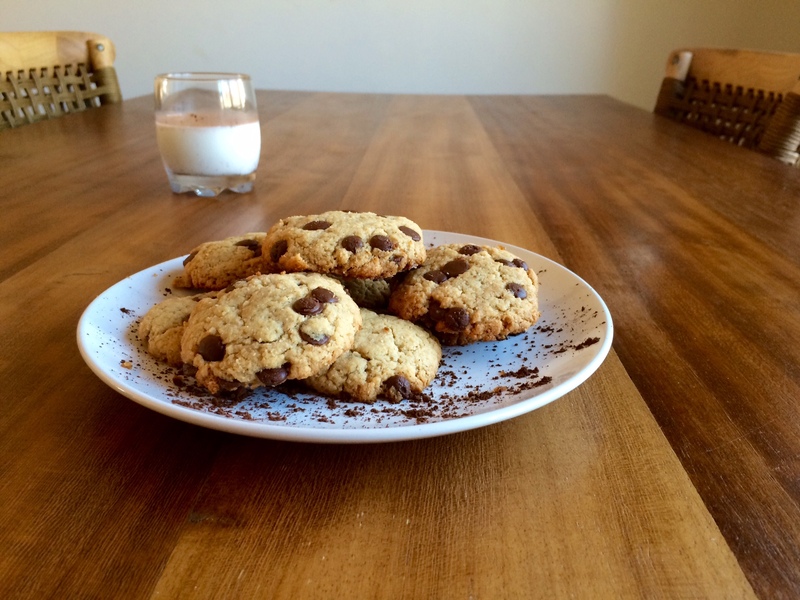 The no wheat and no gluten take the crunch out of these cookies but let me tell you, they’re delightfully chewy and the fact that they’re practically guilt-free makes them even better! This one’s for anyone who’s ever been let down by their choice of biscuit. Chin up dear, you’ll never see the fresh ones coming if you don’t look up. I would know, had I not been looking up, I wouldn’t have the one I have now. (Shout out to Ryan, the best biscuit I ever got to choose). This post is for someone who is braver than she knows, for Carms who finally got the biscuit she deserves and for Steve, Ric and Carl who are in actual fact, really just biscuits! It’s also for my dad, Rob, who always encouraged me to make my own biscuits (opportunities) in this world. Yours in Baking, Bitching and general biscuit badass-ery, (because “xoxo” was too mainstream and because, “you gotta risk it to get the biscuit”). Line two baking trays with silicone mats or baking paper. Beat the egg, add the xylitol, almond butter, coconut flour and bicarb. Mix well. Using a tablespoon, take one tablespoon of mixture and roll it into a ball. Flatten slightly with the back of the spoon. Repeat this until all the mixture is finished. Blot cookies with a paper towel to soak up some of the oil from the almond butter. Bake for 10 minutes and remove from oven, allowing the cookies to cool and set for at least ten minutes on the tray so that they firm up. 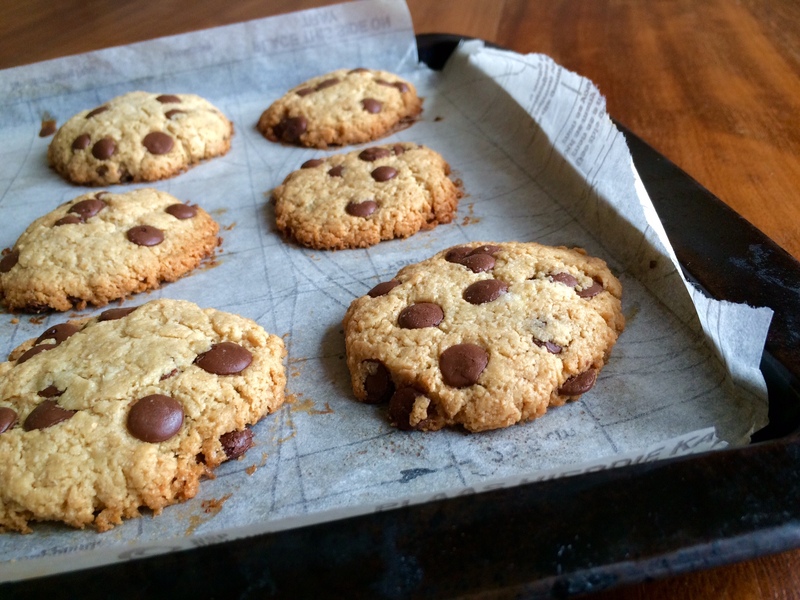 Health hack: Chuck out the choc chips chubby! Or just chop up some Lindt 90%!